A healthy savory breakfast or brunch full of delicious ingredients! 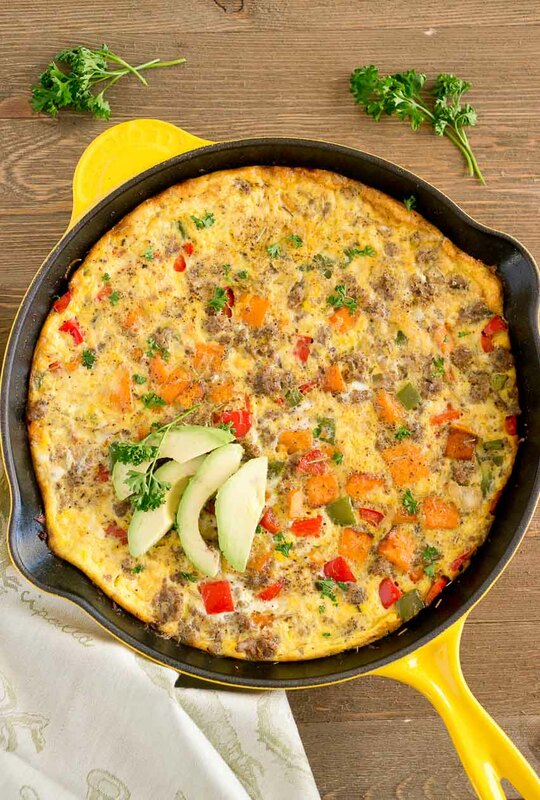 This Sweet Potato Sausage Frittata is perfect for a weekend brunch or weeknight dinner! This impressive but easy frittata is Paleo and Whole30 friendly, and a recipe you’ll turn to again and again to feed your family and friends! Spring is almost here! I can hardly believe it’s already mid-March. It feels like this year is flying by way too fast. But I love the warmer weather, the trees, and flowers blooming, as well as the longer days! The winter here in Alabama hasn’t been very cold but I’ m definitely looking forward to warmer temperatures, enjoying the sunshine outside more often and hopefully a trip to the beach. 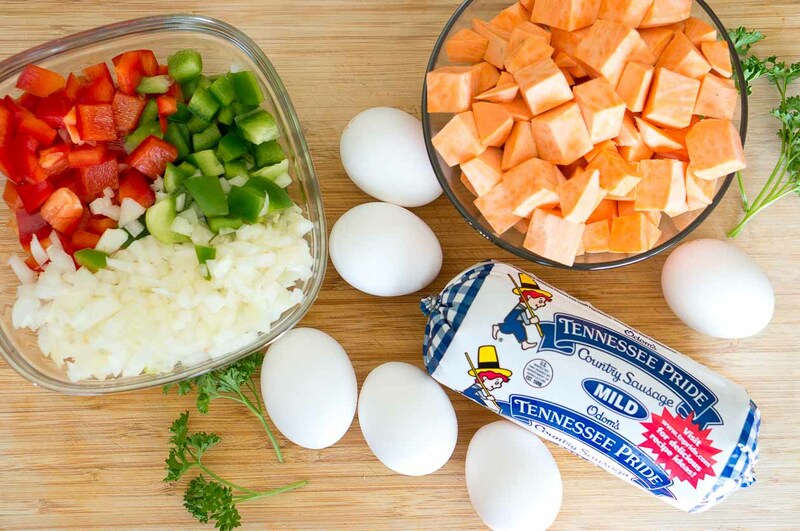 I was shopping the other day at Walmart and stumbled upon Odom’s Tennessee Pride® Country Sausage and thought it would be perfect to make a Sweet Potato Sausage Frittata. It is perfect for any Spring/Easter brunch. It pairs wonderfully with a glass of freshly squeezed orange juice. 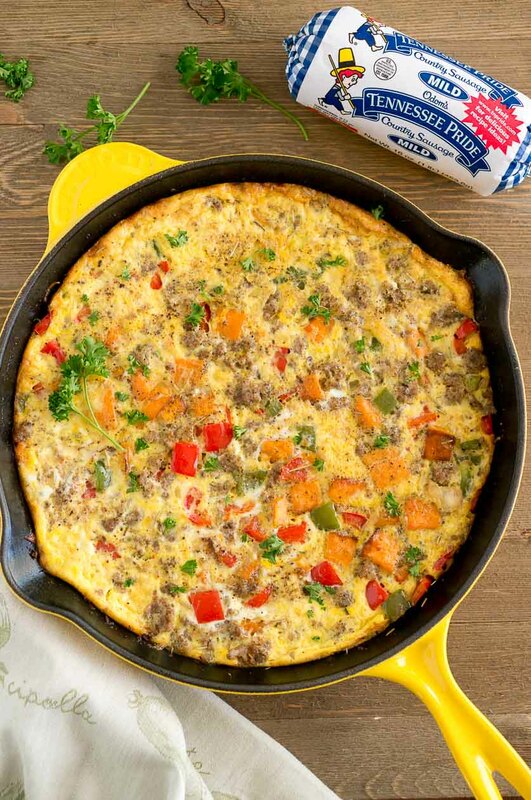 Odom’s Tennessee Pride Country Sausage really takes this sweet potato sausage frittata to the next level and adds so much flavor to the dish. 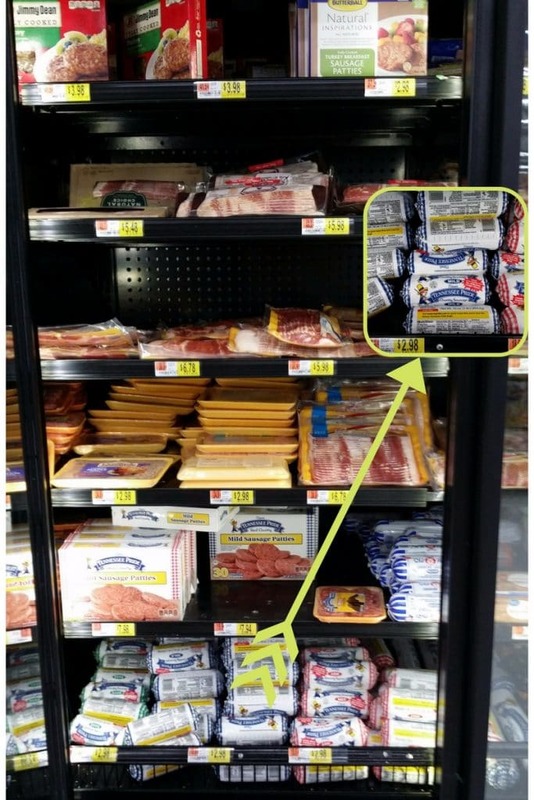 This recipe requires minimal ingredients, and everything can be purchased at your local Walmart. I used one for this recipe and made a Sweet Potato Hash with Sausage and Eggs with the other one. Frittatas are in our regular weeknight meal rotation. A good frittata is an egg dish that can be served for breakfast, lunch, or dinner. They are so easy and fast to make and take to such a variety of different add-ins, it has become a no-brainer meal for me to prepare. The only thing that remains the same is the use of 8 eggs but outside of that, its whatever veggies I have on hand but my favorite flavor combination remains sweet potato and bell peppers. I start it on the stovetop and then transfer to the oven to finish cooking. Serve this sweet potato sausage frittata with a salad and a piece of bread. That’s what for dinner on some weeknights. 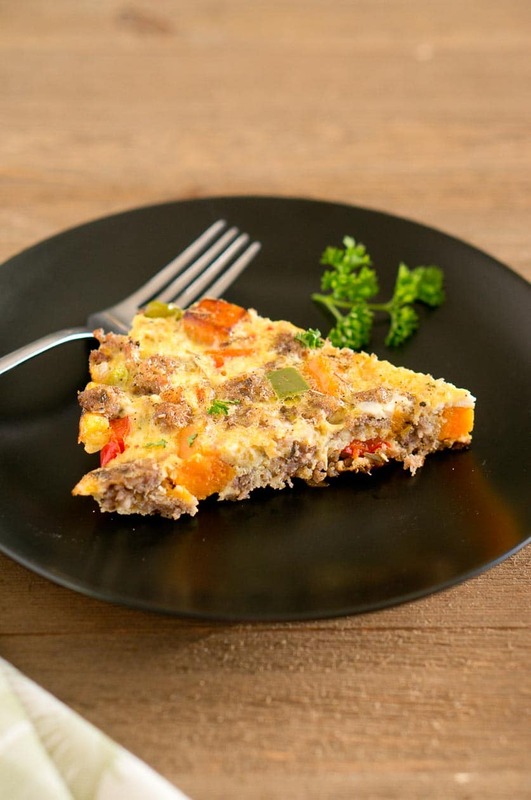 The tender sweet potato and bell peppers and the hearty sausage make every bite of this sweet potato sausage frittata delightful and delicious! 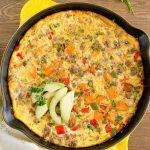 All your favorite breakfast flavors combined, for an out-of-this-world breakfast skillet frittata that is perfect for spring! 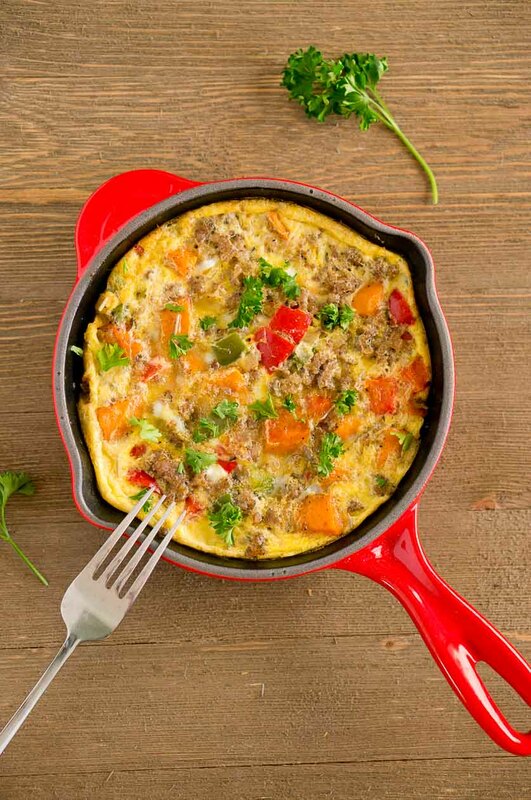 Cook some veggies in a pan, add browned sausage and some whisked eggs, and you have a delicious breakfast that is also easy and nutritious. I believe that breakfast foods should be simple, quick and healthy. And this Sweet Potato Sausage Frittata is definitely healthy and so delicious. Everyone will be asking for seconds. You can also make it ahead of time and warm it just before serving. For example, if you have guests visiting and want to serve delicious breakfast that everyone will love, you can make this sweet potato sausage frittata the night before, and warm it the next morning. You could also pre-cook your mix-ins the evening before, and just bake it in the oven the next morning. Leftovers can be stored in an airtight container in the refrigerator for up to 4 days. You can also prepare and serve the sweet potato sausage frittata in individual portions – I used these small cast iron skillets and they looked so pretty. In that case, just add 1/4 of the veggie & sausage mixture to the skillet, and stir in 2 beaten eggs. If you are looking for more brunch ideas, check out my Breakfast Egg Muffins, Sweet Potato Sausage and Egg Breakfast Casserole, Kale and Sausage Omelet, or Sweet Potato Hash with Sausage and Eggs. Frittatas are similar to omelets but unlike omelets, frittata fillings are mixed in with the eggs in the pan rather than folded in the center. Frittatas are usually cooked in a cast iron pan because they are started on the stovetop and then finished in the oven. You can also bake the frittata in a anven safe baking dish if you have already pre-cooked the ingredients the day before. Frittatas are also very similar to quiches but the difference is that quiches have a custardy crust and they have savory fillings such as mushrooms, broccoli, spinach, ham, sausage, or bacon. It has to have eggs, and it usually has milk, and cheese in addition to vegetables and/or meat. Frittatas are like a crustless quiche or unfolded omelet. What’s your favorite springtime brunch menu item? Let me know in the comments below. A healthy savory breakfast or brunch full of delicious ingredients! A Sweet Potato Sausage Frittata perfect for a weekend brunch or weeknight dinner! In a cast iron skillet, cook sausage over medium-high heat, stirring occasionally, until browned and crumbly, about 5 minutes. Transfer to a plate. Heat 1 Tbsp olive oil over medium-high heat, and cook onion and bell peppers until soft. Add chopped sweet potatoes; season with salt, black pepper, oregano. Cover and cook, stirring occasionally, until tender, about 8 minutes. Add cooked sausage, eggs, and stir everything. Cook until bottom is set, about 2 minutes. Bake in a preheated oven for about 5 - 7 minutes, just until set. Garnish with chopped parsley and sliced avocado, if desired. Can this frittata be cooked then frozen then reheated. Looks delicious!! Perfect breakfast! I haven’t made a frittata yet. I need to start with this one! This looks like my Weekend breakfast plans! Hello! Your recipes sound amazing, I can’t wait to try some! I am about to make the sweet potato and sausage frittata and am wondering if it tastes good frozen and reheated? Also, how many days would you leave it in the fridge for? I haven’t tried to freeze it. I am not sure if it will work because i believe eggs don’t freeze well. This looks really good .. 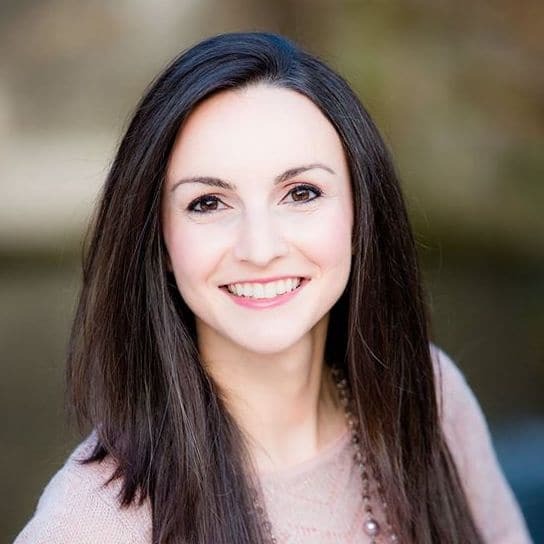 I love sweet potatoes more than regular ones so it would be an awesome change ….